The events of the day have exhausted you. After cooking dinner, reviewing schoolwork, two phone calls, 10 emails and finishing up the dishes, oh, and just a little more laundry, you finally have a moment to breathe. Circumstances seem to be out of control lately. A sick loved one, an unanticipated car repair, you name it, life is moving quickly and you’re just trying to keep up. And really? You feel plain tired. Worn out. Overwhelmed. For this time, no one yells Mom. And you exhale a little longer than usual. A few luxurious seconds pass and it seems that rest, yes, peace, might be enjoyed. You’re not the first person to hear those lies. In the beginning of time, the mother of the human race, Eve, heard this whisper too. When she paused long enough to listen to the whispering ear, Satan took advantage of her and the rest is history. It’s pretty easy to blame Eve, isn’t it? Yet when Satan begins to throw his lies in the middle of your peace, it’s a little tougher to identify him as the scoundrel he is. It’s time to fight back at the first sign of those whispers! You do not have to be overwhelmed; you are an overcomer in Christ! You’re weak and you need to stop. It’s just too much; you’ll never make it. 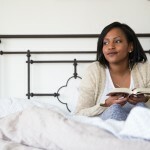 When Satan throws his seductive lies your way, fight back with the truth of God’s Word. I’ve faced experiences that crushed my dreams of a perfect life. But hope rises to greet us when we learn how to run to God’s Word when discouragement strikes. It all begins with just one more step. Also, enjoy this FREE Stepping Stones journal download as the companion guide to One More Step. Rachel “Wojo” Wojnarowski is a wife, mom to 7, blogger, writer and speaker. She and her husband, Matt, enjoy caring for their busy family, whose ages span 3 years to 23 years and includes a special needs daughter. 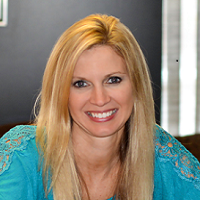 Rachel leads community ladies’ Bible studies in central Ohio and serves as an event planner. In her “free time” she crochets, knits, and sews handmade clothing. Ok, not really. She enjoys running and she’s a tech geek at heart. 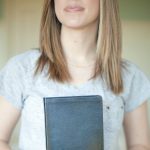 Rachel serves in her local community and also speaks at Christian women conferences. 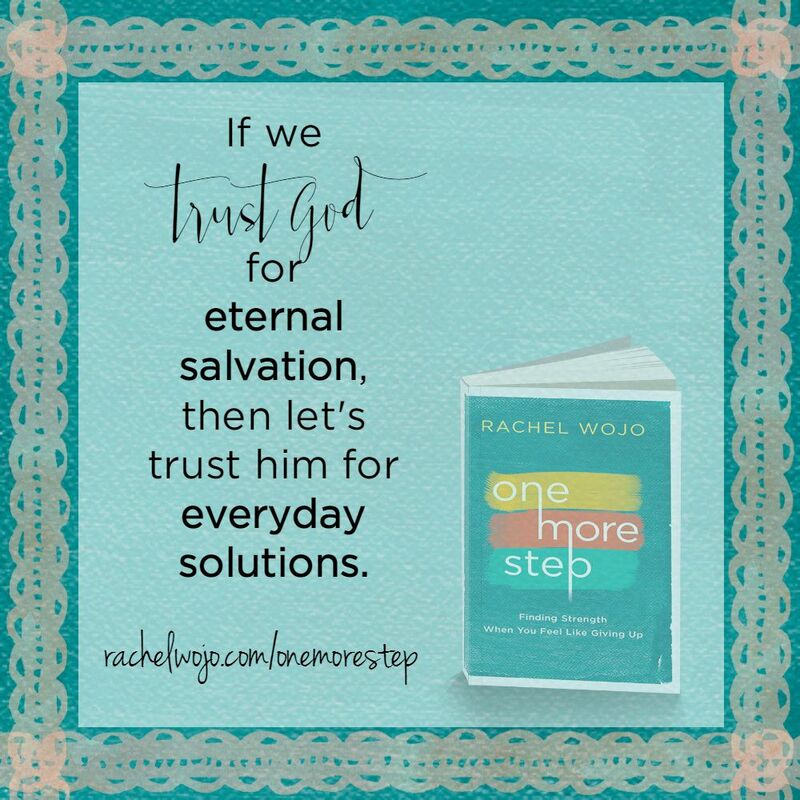 Her book, One More Step: Finding Strength When You Feel Like Giving Up, recently released on October 20, 2015. Wife, mom, reader, writer, speaker and dreamer, you can find Rachel at RachelWojo.com. Where Do You Turn When You’re Ready To Give Up? « How Do You Show Value for Your Child’s Voice? as I am currently getting to described by my family as a ‘grumpy mama’ (heartbreaking, I know! ), it means a lot to me to get these little titbits in my email inbox, very good for helping me be intentional about staying strong, calm and not listening to those whispers. It’s so easy to let our external attitude reflect the internal battles we are fighting. But greater is he who lives in us! I agree- I need the reminders of the truth too. God does not see you as a grumpy mom. I often say that when he looks down at “mom”, he sees “wow.” You are his glorious creation and he has given you a special assignment that only you can do. Wow I am a mommy of 2 beautiful angles. And I.love the post as the Word of.God is the ultimate upliftment. But I am getting through the day and just.looking aftr my.kids. I don’t clean or run or.keep diary as I use to. How do I get to that point agian? Wow, my Christian coworker just finished telling me a story that was so similar to this post, and then I opened my email to see this and my jaw dropped! She mentioned how Scripture says that the enemy is like a lion, but he is not the Lion! Our God is! This post is so timely! I’ve been a fan of you Rachel doing the monthly challenges. Of late im feeling weak and almost want to stick to my bed. just dragging my way through work, family, cooking… but today ur post was such an encouragement that im planning to print it out and put it on my fridge so that when ever i feel weak i can draw strength from God through these scriputures. Yes! He will carry you, Mary. He never fails on his promises! Lots of Love and Blessings to you!!! Blessings to you, sweet Anne. God knows what we need when we need it. Funny thing- my email service was having problems today and this went out late. His timing is always perfect. 🙂 love and prayers Anne. Amen to that! 🙂 Very nice to have a personal response from you! I know that you are busy, busy!! Love and prayers to you as well! !